What is COM port over TCP/IP technology? 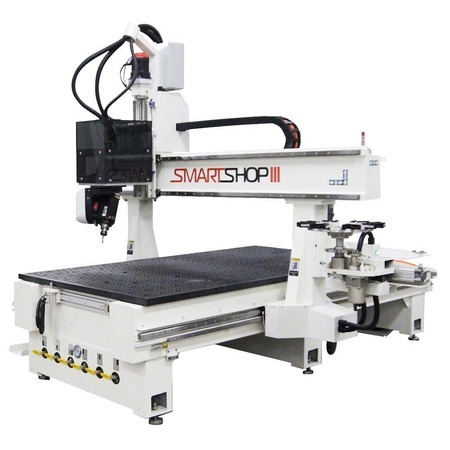 With the emergence of CNC machines, the highly technical manufacturing process like cutting, carving and milling designs from wood, plastics, foams, metal, etc. have become more precise and efficient. Now, a range of complex machinery is controlled by pre-programmed computer software, which relieves live operators from the need to guide the commands of factory tools via levers and buttons. Computer numerical control (CNC) allows automating operations of mills, lathes, routers, grinders, lasers and other machinery. In addition, it opens the way to access manufacturing tools remotely. In this article, we’ll tell you how to easily connect to a CNC machine over the network and control it from a remote computer regardless of its proximity to the actual device. Serial over IP Connector is a dedicated software application that helps you access a remote CNC machine in real time via the device’s serial port. The solution is designed to convert serial port data to TCP/IP packets for their further redirection to a remote computer over LAN or the Internet. This COM over IP software gives you a way to create a virtual serial port on your local computer and then link it to a real COM interface of a remote CNC machine. By using this network connection, you can load programs and data to remote CNC machine tools. Let’s imagine there’s a CNC machine supporting Telnet (RFC 2217) communications. You need to send some data to it from a specialized application running on your home computer. To achieve this, you install RS232 to IP software on your PC and establish a client connection to the remote CNC equipment. Once the connection is created, you are able to “talk” to the remote machine as though it were attached directly to your computer’s serial port. What’s especially convenient is that there’s no need to install serial to TCP/IP converter software on the remote end. If you are working with a time-sensitive app, you can select the UDP/IP protocol and forward your serial data over a local network. Or choose the RAW data transmission algorithm and the data will be sent “as is”, without any additional protocol-specific formatting. Now, let’s see how to share access to your manufacturing equipment among multiple network users. First, you should connect the required CNC machine to a serial port of your PC. Then, install Serial to TCP/IP Connector software. This app will help you turn the PC into a COM over IP server. Once done, start the program on your computer and share the serial port over the IP network. After being shared, the port with the device attached becomes available for connections from remote client computers. With a reliable serial port over IP redirector app, CNC machine operators get the ability to edit programs, check cut progression or troubleshoot from any PC - be it a host computer or a guest OS. In order to connect to a serial device over your IP network, first of all, you need to share the host’s COM port to which the equipment is attached. Eltima’s RS232 over IP Connector will let you do this with a couple of clicks. Once the host’s serial port is shared, create a virtual copy of this port in your guest OS. 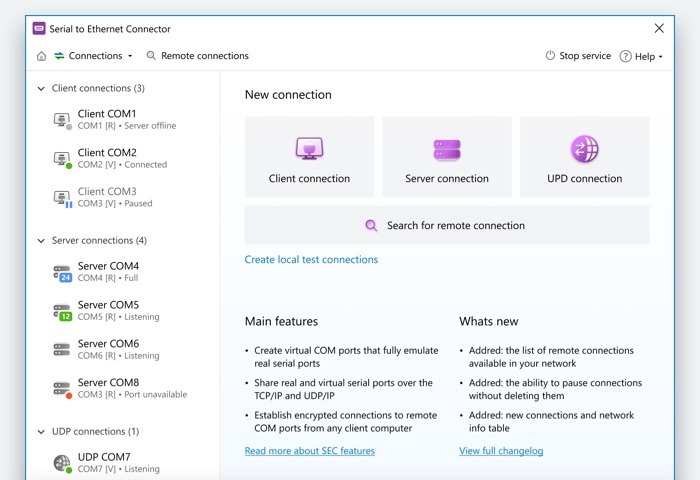 Next, specify a TCP port to connect to and the IP address of your host computer and establish a client connection to the shared serial port from your virtual machine. This is it! Now you can access the virtual port from your CNC app and the dedicated software RS232 over IP connector will redirect the input/output data from this program directly to a CNC machine over a serial connection over IP. Fabrication with CNC machines brings many challenges. It often happens that you need to work from an office quite separated from the factory floor. In this case, sharing your serial equipment over the IP network is probably the best option. Remote access to COM over IP means you can run your CNC machine from any device on your LAN or Wi-Fi network. So, let’s have a look at the most common ways to share a serial device over IP. The first method allows you to transfer data between a CNC machine and the computer which is controlling it over Wi-Fi. What makes it possible is the GRBLWeb software running in your browser. The program lets you control your GRBL board over Wi-Fi with the help of a Raspberry Pi. A CNC router running GRBL 0.8, a Raspberry Pi board, a Wi-Fi dongle, a USB A-B cable, an SD card, a 5VDC USB Power Supply, a USB A-Micro B cable, an Ethernet cable, a Wi-Fi router with DHCP enabled and at least one free Ethernet port. SDFormatter, Win32DiskImager, WinZip or any other unzipping utility, and PuTTY SSH client. Use the SDFormatter program to format your SD card in order to make it work with the Raspberry Pi. Move the Raspberry Pi Image to your SD card with the help of Win32DiskImager. Insert the SD card into the Raspberry Pi. Attach the Raspberry Pi to your router via an Ethernet cable and connect a 5V micro USB power supply to the Raspberry Pi. LEDs on the board should indicate that the boot process has started. Now, get an IP address for your Raspberry Pi. The IP address will be assigned to your Pi by the router using DHCP. Log in to the Raspberry Pi. To do this, in PuTTY SSH client, enter the IP address of your Pi, choose SSH and click Open. In a terminal window that will appear, enter your default login credentials "pi" and "raspbian". Next, you should open the configuration menu for the Pi and change the password. Also, select your language and timezone in the "Internationalisation Options." Now, it’s time to set up Wi-Fi. At this stage, you should modify the instructions in a configuration file so that they meet your needs. It’s recommended that you set up the Raspberry Pi to have a static IP address. Once the Wi-Fi configuration is complete, link the GRBL board to the second USB port on your Raspberry Pi via a USB A-B cable. Start your CNC machine. Launch the GRBLWeb software in your browser and check the status of your CNC machine by typing http:// + [your Pi's IP address] and pressing Enter. Then, find the Arduino running GRBL in the drop-down menu of the app. Finally, try controlling the movements of your machine from the program. It’s also worth mentioning that remote access to a CNC machine is not always the safest option. It is rather uncommon to make the whole process automatic without human action. Your device may miss some steps or lose a bit, so there should be either an operator supervising the process or a reliable monitoring system. You should also keep in mind that to make things work properly, you’ll need to spend some time learning the GRBLWeb program. RS485 to TCP/IP Converter by Eltima is proven to be one of the simplest and safest ways to share RS485/RS422/RS232 devices over IP network. No additional hardware or cables. No programming skills are required. You just install a compact app on your local computer and share all or any of your serial ports over TCP/IP. Now, let’s consider another efficient way to create a wireless connection to a CNC machine from your PC. To accomplish this task, you’ll need a special serial over IP hardware like the WF5000B by U.S. Converters LLC. This serial WiFi adapter should be connected to a CNC machine you are going to communicate with. Most CNC machines come with either a 25-pin or 9-pin female serial connector. However, sometimes CNCs have a male RS232 port connector instead of a female one. In order to connect your serial to IP hardware to a CNC machine which has a 25-pin female connector, you should use some additional 25-pin male to 9-pin female serial port adapter as well as a male/male gender changer. For a CNC with a 25-pin male connector, use a 25-pin female to 9-pin female adapter. Once a serial port adapter (if needed) and the WF5000B hardware are successfully connected to your CNC machine, you can continue with WiFi configurations. So, you should start your computer, find the WF5000B device on the wireless network and set up the parameters of its COM port so that they match the parameters of the serial port you used on your CNC machine (you can check the CNC’s port settings on the machine’s user panel). After that, you should create a virtual serial port which will be used by your CNC software for a wireless connection from your Windows PC to a remote CNC machine. A dedicated RS232 over TCP/IP app like Serial to Ethernet Connector will help you do this. It will let you not only create virtual COM ports on your computer but also share serial over IP on Windows and Linux platforms. OPC software is another popular method to access a remote serial port over IP from Windows. OPC is the interoperability standard for industrial telecommunication. This standard allows a reliable exchange of data between Windows apps and industrial equipment. The OPC method is based on server-client communications. The OPC server software is aimed at abstracting the communication protocols of PLCs (programmable logic controllers) and converting the PLC data into the OPC protocol, while the OPC client software can be any human-machine interface program that workers use to control the hardware via PLCs. The OPC server helps the OPC client to convert read/write requests and exchange data with the hardware like a CNC machine. This open standard is widely used in industrial automation systems. It is quite functional and means lower costs for hardware manufacturers. By providing a single OPC server, the manufacturers of industrial hardware enable their devices to talk to any OPC client. As for providers of industrial automation software, they can just add the OPC client capabilities to their products, and the apps will become compatible with numerous hardware solutions. OPC aggregation: the connection is established between one OPC client and multiple OPC servers. OPC tunneling: the OPC client connects to the OPC server across the network. OPC bridging: one OPC server connects to another OPC server in order to share some data. What is serial over IP technology? Serial over IP technology gives a way to share serial (RS232, RS422, RS485) port data over the IP network among multiple networked computers or devices. This allows users of some managed systems like blade servers to access the systems’ programs via a COM port. A wide range of specialized devices, including various medical and lab instruments, POS hardware and industrial machines, rely on RS232 interfaces to connect to computers. The manufacturers of modern computers and laptops, however, tend to replace serial ports with USB ports. As a result, users of serial-based equipment face a real challenge trying to connect their valuable devices to a PC. At the same time, thanks to its flexibility and simplicity of implementation, the RS232 communication protocol is expected to be still used in many spheres of our lives for the foreseeable future. It shouldn’t come as a surprise that many modern devices such as barcode scanners, POS terminals, surveillance cameras, GPS devices, etc. connect to computers via serial ports. It’s also possible that the RS232 standard will remain one of the most common ways to provide communications between PCs and their peripherals. New-generation devices that fit a USB port instead of a serial interface still have a driver that allows them to emulate RS232 port for connections to serial apps.